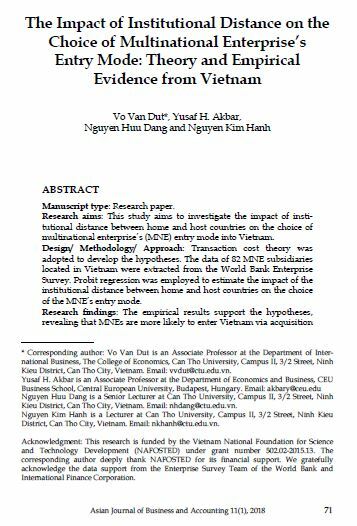 Research aims: This study aims to investigate the impact of insti- tutional distance between home and host countries on the choice of multinational enterprise’s (MNE) entry mode into Vietnam. Design/ Methodology/ Approach: Transaction cost theory was adopted to develop the hypotheses. The data of 82 MNE subsidiaries located in Vietnam were extracted from the World Bank Enterprise Survey. Probit regression was employed to estimate the impact of the institutional distance between home and host countries on the choice of the MNE’s entry mode. Research findings: The empirical results support the hypotheses, revealing that MNEs are more likely to enter Vietnam via acquisition investment rather than greenfield investment. This happens when both the formal and informal institutional distance between Vietnam and the home countries is large. Findings also suggest that the institutional distance between a host country with a transition economy and the home countries is an important element to take into account when MNEs decide to invest in a transition economy that contains high level uncertainties. Theoretical contributions/ Originality: The adoption of the trans- action cost theory enables this study to conceptualise the frame- work which is used to empirically test the effect of the institutional distance between Vietnam and home countries on the MNEs’ entry mode decision. This study shows that the transaction cost approach offers insights into how the institutional distance between the host and home countries affect the choice of the MNEs’ entry mode into a transition economy. This study contributes to international business literature by developing theoretical arguments about the role of the national institutional dissimilarities on the choice of the MNEs’ entry mode in a transition economy. Practitioner/ Policy implications: The implication drawn from this study is that MNEs investing through acquired subsidiaries are less burdened by environmental uncertainties since acquired subsidiaries offer more familarity with the formal institutions. This can help the MNEs to establish a close relationship with the local partners and the government. This also increases the MNEs’ cross-cultural communication and knowledge thereby, enhancing the investment. Research limitation: Further research should consider more parent firm characteristics so that implications for the MNEs’ entry strategy are developed. Given the role of the different managers at the different levels, future study should capture the perception of these managers who are based at the headquarters so as to further examine the effect of institutional distance. Keywords: Formal Institutional Distance, Informal Institutional Distance, Entry Mode, MNE, Subsidiary, Transition Economy. VAN DUT, Vo et al. The Impact of Institutional Distance on the Choice of Multinational Enterprise’s Entry Mode: Theory and Empirical Evidence from Vietnam. AJBA, [S.l. ], v. 11, n. 1, p. 71- 95, june 2018. ISSN 2180-3137. Available at: <https://ajba.um.edu.my/article/view/12147>. Date accessed: 25 apr. 2019. doi: https://doi.org/10.22452/ajba.vol11no1.3.